Welcome to the Best Western Plus Chalmette! Our guests enjoy our unique quiet location, we are just an 8 mile drive to the French Quarter of New Orleans and minutes from the city's dining and nightlife. No matter what brings you to Chalmette, whether it's a peaceful escape or you want to enjoy everything the region has to offer, we are your Best Choice! We are located in the middle of St. Bernard Parish, known for the annual Crawfish Festival, Chalmette Battle Field, Fishing and Birding. Chalmette also has plenty of dining and shopping options should you want to stay close to the hotel. 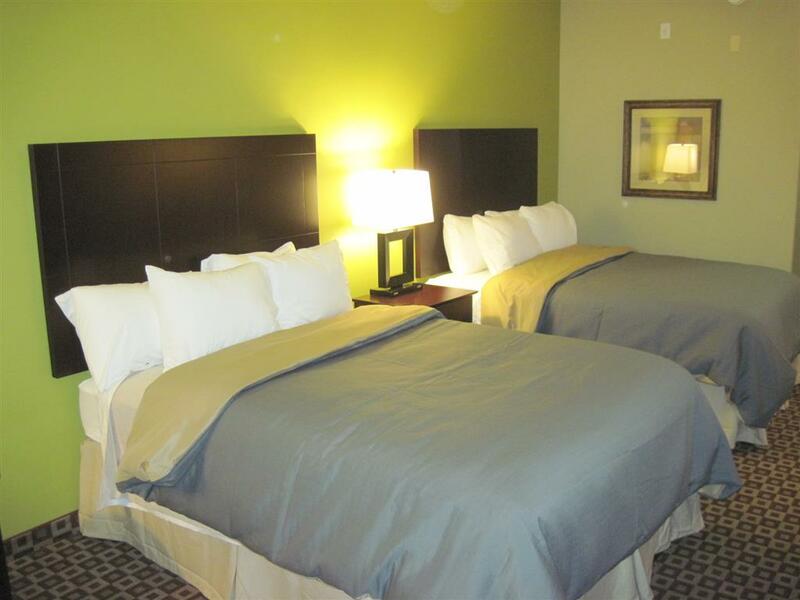 Our Chalmette hotel has 65 nicely appointed spacious guest rooms and suites all equipped with wired and wireless Internet, microwaves, refrigerators, and 42" televisions. The hotel has an outdoor seasonal pool as well as a Fitness Center, Board Room and Business Center. We provide all of our guests a complimentary American Breakfast with hot Belgian Waffles served in our Lobby daily as well as complimentary parking. We welcome business travelers from around the area including Exxon, Valero, NASA, Folgers, Domino Sugar and Jackson Barracks. We are located just minutes from each location and provide a true Southern Hospitality experience to all of our travelers. If your travels bring you to Chalmette whether for business or leisure we are delighted you have given us the opportunity to serve you and to realize why Best Western is the world's largest hotel chain. WoW Cafe Wingery: 2.00 mile(s) from WoW Cafe Wingery, full service, American, open for: lunch, dinner, World of Wings and so much more! Wraps, salads, tenders, fajitas, quesadillas, ribs, red beans and rice, Texas Toast burgers. Riverwalk Marketplace,13.40 mile(s) from Riverwalk Marketplace, near the French Quarter and connected to the Convention Center, Riverwalk is the home of 140 stores and restaurants. Delgado Community College,14.68 mile(s) from Delgado Community College, founded in 1921, it is Louisiana's oldest and largest community college and serves students throughout a ten parish region. Tulane University,12.80 mile(s) from Tulane University, a selective private research university founded in 1834 in New Orleans, is a leader in scholarly initiatives and public service. Our Lady of Holy Cross,16.46 mile(s) from Our Lady of Holy Cross, OLHCC is a private Catholic institution located in New Orleans, Louisiana offering academic programs for undergraduates, graduates. Dillard University,8.95 mile(s) from Dillard University, experienced and respected faculty creates a rich learning environment, preparing students for a bright and successful future. Discover the possibilities of a Dillard education. Loyola University,12.58 mile(s) from Loyola University, is a Jesuit university offering undergraduate courses. Insectarium,11.20 mile(s) from Insectarium, Audubon Insectarium, located in the U.S. Custom House on Canal Street, encourages you to use all five senses as you explore North America s largest museum devoted to insects and their relatives. French Quarter,8.37 mile(s) from French Quarter, Bourbon Street, ghost tours, antiquing, live entertainment. Audubon Zoo,15.20 mile(s) from Audubon Zoo, located in historic uptown New Orleans Audubon Zoo offers an exotic mix of animals from around the globe, engaging educational programs, hands-on animal encounters and lush gardens. New Orleans Arena,12.00 mile(s) from New Orleans Arena, the premier destination for top-rated concerts and events in the Gulf South. Alero Center,23.38 mile(s) from Alero Center, the premier New Orleans venue for small to medium size trade shows, conventions. Pontchartrain Center,22.50 mile(s) from Pontchartrain Center, a multi-purpose center for mid-size trade shows and conventions, only minutes from downtown New Orleans.